Hearts will sell Jamie Walker to the highest bidder this summer after the winger admitted he wants to leave Tynecastle. Director of football Craig Levein is reluctant to let the 23-year-old go but his contract expires next summer and he won’t sign another one. 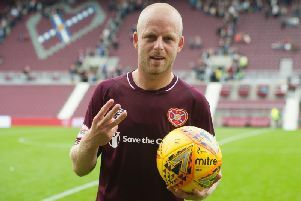 Hearts will demand a transfer fee well into seven figures and have already had approaches from clubs keen to sign Walker. A graduate of the Riccarton youth academy, Walker has been a first-team regular for the last five seasons and now wants a different challenge, according to Levein. Hearts are preoccupied with strengthening their squad at the moment having released six players last week – Andraz Struna, Alex Tziolis, Tasos Avlonitis, Lennard Sowah, Dylan Bikey and Moha Choulay. Levein stated that another five or six new recruits are necessary to add to the return of Christophe Berra. The plan is to bring in players with more of a Scottish or British background. “Yeah, there’s an element of that. Scottish or British is what we’re looking to do. How many? Five or six players, something like that,” said Levein. • Former Hearts full-back Faycal Rherras has joined KV Mechelen. The Moroccan internationalist was released earlier this month and has moved back to Belgium, where he played before moving to Tynecastle.